Hey Rhonda! Boy did I have some catching up to do with your posts! So sorry! Lot's going on here lately too. I just love your camping photos! Your mother was quite a looker! LOL! Seriously she was what I would call a classic beauty! I loved seeing some of the old campers. I sometimes miss ours, we have great memories and photos much like yours that I am sure I kids will cherish...one day! I am sorry to hear of your family losses! I found your geneology post very interesting though. We always have a long going discussion (argument) with my husbands cousins over the whole 1st cousin second cousin thing. Our big question is what do you call the relationship between our kids and my husbands cousins kids? Would this be second cousins? Still confused on that one! Congrats to your winners too! loved the trip down memory lane.. 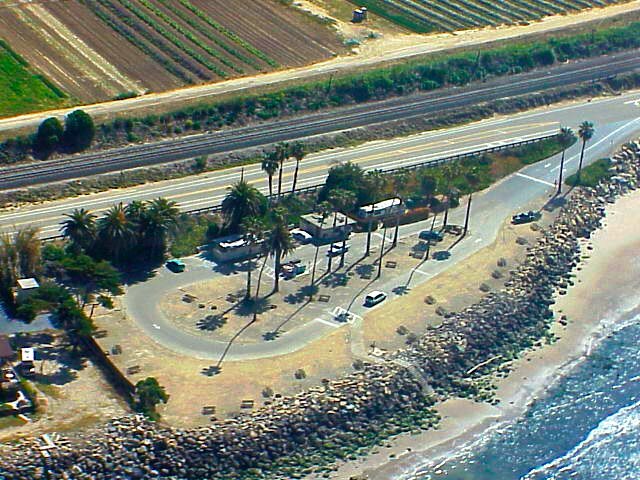 I too lived and loved in Ventura..
Two houses between me and the beach.. and tar on my feet from the offshore oil wells in the channel..
experienced my first "Grunion Run" while living there..
but that's another story for another time..
how I miss the days of campfires on the beach..those CAREFREE days..and nights..aaah! Rod McKuen poems take me back to those times.. I love this post, Rhonda!! I want to go camping now! And what an awesome surprise to have won the giveaway. Thank you, thank you!!! Will send my info shortly!! On a side note..., I'm surprised that it is not hotter here in South FL in the summer. Two days ago I was even cold coming out of the pool -can you believe it. What a wonderful post! 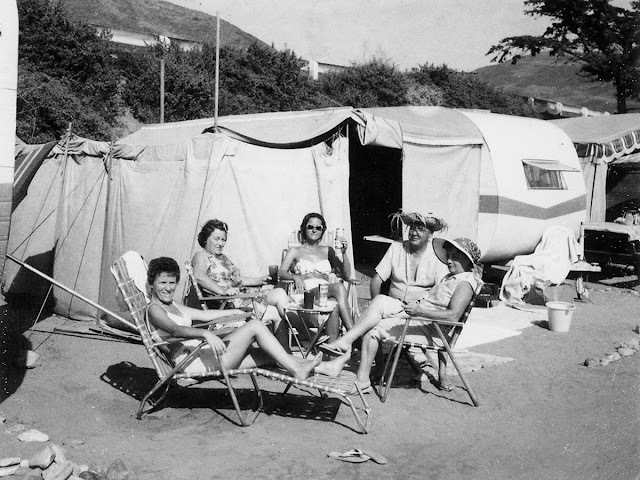 I have missed reading your blog, so glad to see it shared by Sarah (abeachcottage) Your post brings back so many good memories for me too - my family had a beautiful pink and white trailer, that was towed with our big pink and black 1956 Lincoln. We were so styling! Rhonda these pics are soo awesome! I too am a camper. In fact we just returned from our 6 day trip on the Edisto River. I have got to dig out the photos from my childhood camping days. Have a great day! We still have our 3 room tent, but haven't used it for 10 years. You make me want to camp on the beach! I love beach camping! Especially the way you've done it! So.. congrats to Maya and Diane.. lucky girls... I'm sure they will treasure their win from you.. just as you treasure all your wonderful memories of your family and growing up with such enthusiasm for life.. the beach and having fun.. .. I'm not sure if I remember this post.. but I do remember the shots of your mum.. what a stunner!! How fun. Our summer vacations when I was little we spent a week on Daytona Beach and a week on Miami Beach. 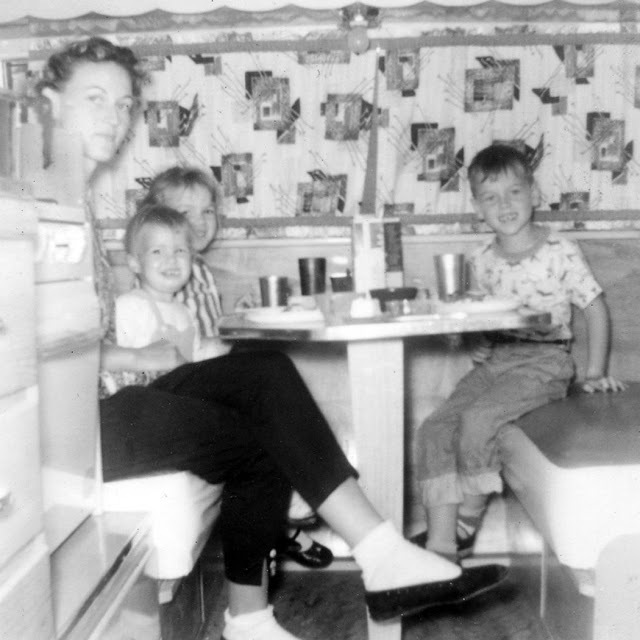 We would have a motel with a kitchenette and my mom would cook, we would swim all day and sometimes do arts and crafts in the "kid's room" at the motel. Such a simple time and yet so many great memories! What a great pic of your mom. We are due a camping trip. Ft Desoto works for me. I loved hearing your wonderful camping memories. It sounds like you had such a fun childhood at your special beach. I enjoyed seeing the pictures. I am probably going to shock you now but I have never ever camped in my life! 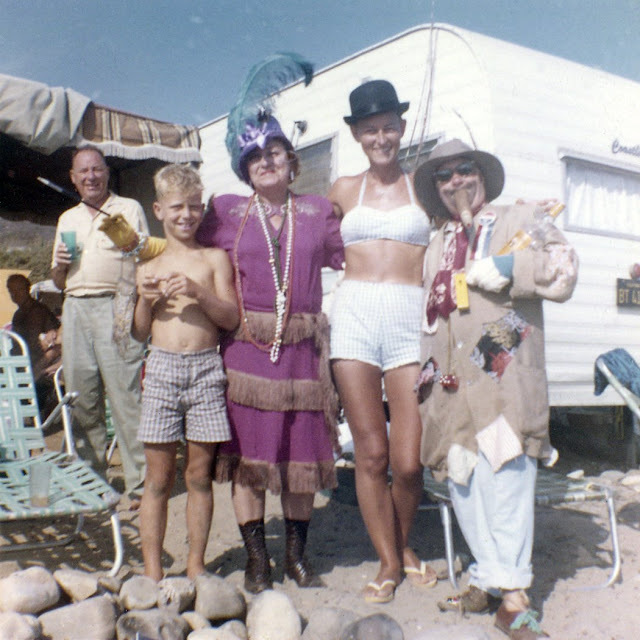 We stayed in a caravan (trailer to you) a couple of times for a holiday when I was a child but it always had a real loo and shower! I think maybe the weather over here in England deters many like myself from camping or that's my excuse anyway. You make it spound very appealing especially in California. Welcome back my friend!! Your family looked like they really had a wonderful time. I would have loved to join you scrambling on the rocks like that. Your mom was GORGEOUS!! What a great place to hang out. That is so cool Rhonda! I am jealous of your amazing childhood! The pics just take me back to a different time. I was born in Aug. 1956 but I still feel like i can remember a bit of the 50's. Your Mom looks like she was so much fun, really this is such a good post! I missed you and so glad your back in bloggyland! What a hoot! Didn't realize that your love of the beach was genetic! LOL! The photos are treasures. Absolutely! oh, once again, you have put a smile on my face this Friday morning!! and my heart feels as warm as a toasted marshmallow!! Your mom's potato sack dress provided an inspiration for a St. Patrick's Day party. Your mom seemed like an amazing woman. I hope the new job is working out. I'm sure it has kept you busy. I'm glad you took the time to visit. What a fabulous post...love the pictures. Those were the days, just aren't words, they are the best memories we have. 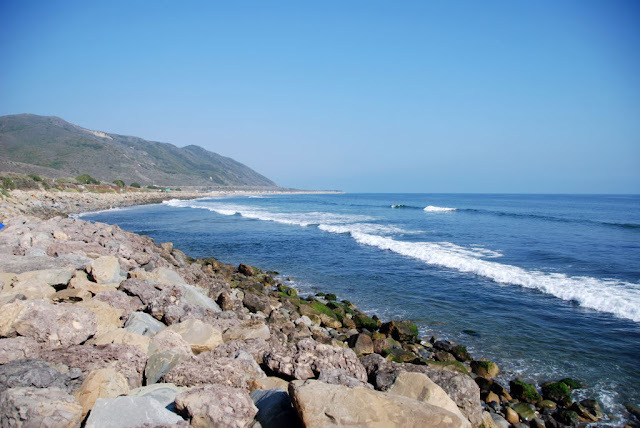 I spent a few hours today, doing nothing but watching classic movies on TCM, love those California beach movies especially, and that's what your beautiful photographs remind me of. I get a bit sentimental sometimes, OK...a lot of times, when i think of the west and how much I miss it, and those good old days...seeing your post, though I was in one of those moods today, really lifted my spirits and know that God is in control and I must continue to be patient. It's really great to be able to read someones post, and though they may not know it, they have lifted your spirits, and that is what yours has done for me. Thank you. Hope you have a wonderful week ahead. 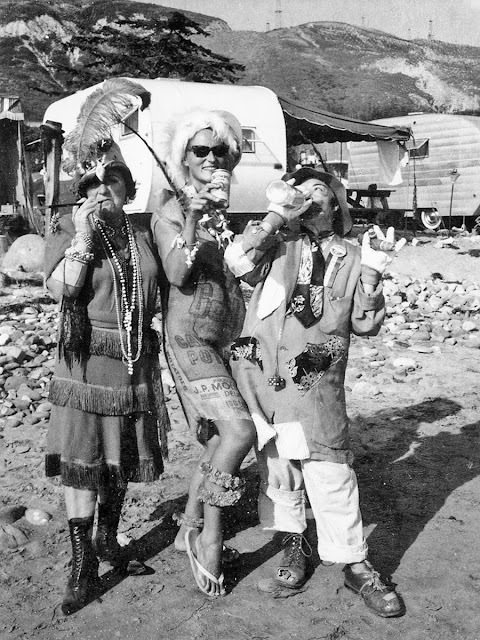 Those camping photos are a hoot!!! Love it! Thanks for sharing. Wanted to let you know I'm now following!!! Rhonda...I know what you mean about missing California, though I never had the opportunity to actually live there, since my Father does, it was like a second home for many years, and I miss it more than words can say. Those memories are some of my most treasured. But, I know in time, when it's right, God will guide us there. And as far as the lotion goes, you will love it. So different than many products I've tried, and I am a little picky some would say, and you can tell it's crushed pearls, not sparkles, keeps your skin so soft not sticky and last all day, here in Florida, we don't need sticky - and does have the coconut fragrance, but not over powering, just a slight hint of the tropics. Thank you so much for the sweet anniversary comment. So looking forward to your next post. Hi Rhonda! Thanks for stopping by! 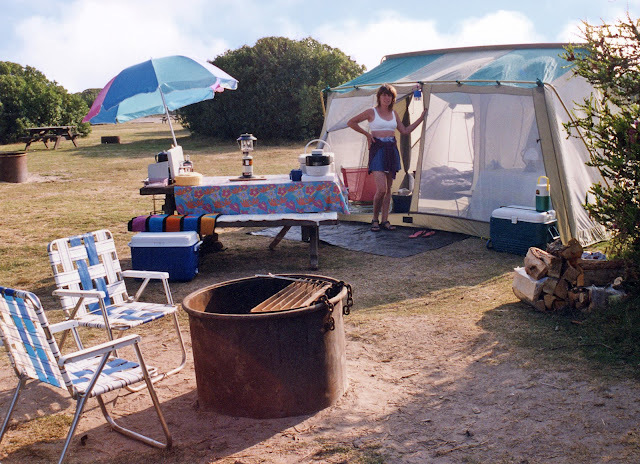 I love this post about camping along the CA coast way back when! I can remember sitting on the beach while my parents cooked on a hibachi and if there was a little sand on the food it just didn't matter! LOL! I will definitely be around for next year's World Oceans Day! Sorry I haven't written lately. I just haven't had time to blog...no time to even read my favorites. Hopefully I will have a new post up in the next day or two. I haven't had a chance to catch up with your recent postings. Sounds like you have had a lot going on. Hope it hasn't been too bad. Seems like every time I've turned around lately there has been bad news. 2011 hasn't been the best of years....I'm looking forward to next year! Beautiful pictures! Beach camping is definately a great goal. If only I could convince the Mister... his eyes are set on a sailboat first and THEN a camper someday. We may just end up camping on a sailboat and see where the waves take us. What a great place and amazing memories! I love the photos, how fun to have grown up there and create such bonds with others. I love the potato sack dress and your mom is gorgeous! My favorite memories are that of "our" cottage, growing up there in the summers, being with family and friends, it really doesn't get much better. I am so sorry about the losses of your cousins and I hope that you are doing good. Come camp St. Andrew's State Park in Panama City!!! Happy 60th girl! There is a party at my place for you. HAPPY HAPPY BIG 60 TO ONE VERY SPECIAL FRIEND AND BLOGGER EXTRAORDINAIRE!!! We miss you .. hope you have a FABULOUS birthday and that the celebrations go on for days..